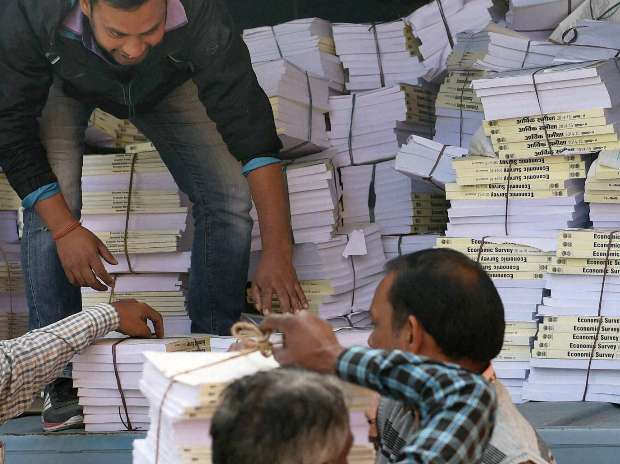 Copies of Economic Survey 2014-15 being carried for their distribution among the Members in Parliament Hosue in New Delhi. India's external debt stood at $442.3 billion at the end of March 2014, said the Economic Survey for 2014-15 which was tabled in parliament by Finance Minister Arun Jaitley Friday. "Post 1991 BoP (balance of payment) crisis India's prudent external debt policy and management with a focus on sustainability, solvency and liquidity have helped contain the increase in size of external debt to moderate level," the survey said. According to the annual report card on the state of the country's economy, the rise in external debt during the period was due to long term debt particularly NRI (non-resident Indian) deposits and commercial borrowings. The survey pointed-out that at the end of September, 2014, the long term debt accounted for 81.1% of the total external debt vis-a-vis 79.8% at the end of March, 2014. While, short term debt accounted for 18.9% of the total external debt vis-à-vis 20.2% at the end of March, 2014. The survey, which was tabled a day ahead of the union budget showed that the net external commercial borrowing has also increased from $2.4 billion in 2013-14 to $3.4 billion in 2014-15.